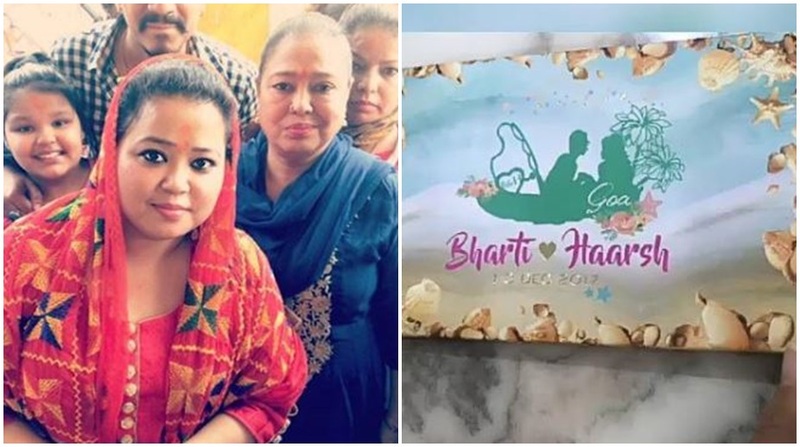 TV’s most popular comedienne, Bharti Singh has started distributing her wedding cards. She gave the first wedding invitation at Shri Siddhivinayak Temple in Mumbai. The actress, who is getting married to her long-time boyfriend Harsh Limbachiya shared a video of her wedding invitation card and it looks really appealing. They have added personal touch to it with their pictures popping out from each page, telling a story of them. The first page is quirky and has “Dulha Hum Le Jayenge (We will take away the groom)” written on it. The card looks beachy with shells stuck on a net on the outer box. Bharti is eagerly waiting for her D-day and to enter the marital bliss. The two are getting married on December 3. The couple was earlier seen matching steps with each other on the sets of Nach Baliye. They were loved by fans, but couldn’t sustain in the show for long as they faced tough competition from their competitors. Bharti is quite excited about her marriage celebrations and the preparations of her big day are in full swing. The couple will have a destination wedding in Goa.